Click on title to view photo in large format. Lovely Shukkei-en Garden in Hiroshima, Japan, was created in 1620 by Ueda Soko, a renowned master of the tea ceremony. Located near the hypocenter of the Atomic Bomb blast, the gardens were extensively damaged during WWII. In the months following the bombing, the gardens were closed to the public and used as a refuge for victims of the war. In 1951, they were restored and reopened. Shukkei-en Garden is an oasis of serenity, with meticulous landscaping surrounding Takueichi Pond, and a stone arch bridge that separates the pond into two parts. Fourteen islands of different sizes dot the pond. Some islands are in the shape of tortoises and cranes, both symbols of longevity. 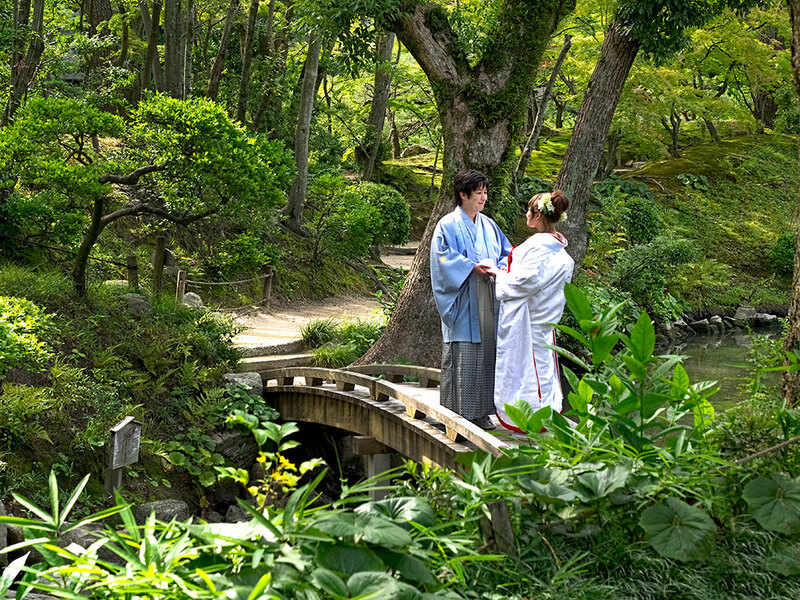 Today, the garden is a popular place to take wedding photos and perform tea ceremonies. So different than the bad old times after The Bomb … glad to see it is a place of peace again. Hi Selma: It’s the most amazingly peaceful country I’ve ever visited. It was wonderful.